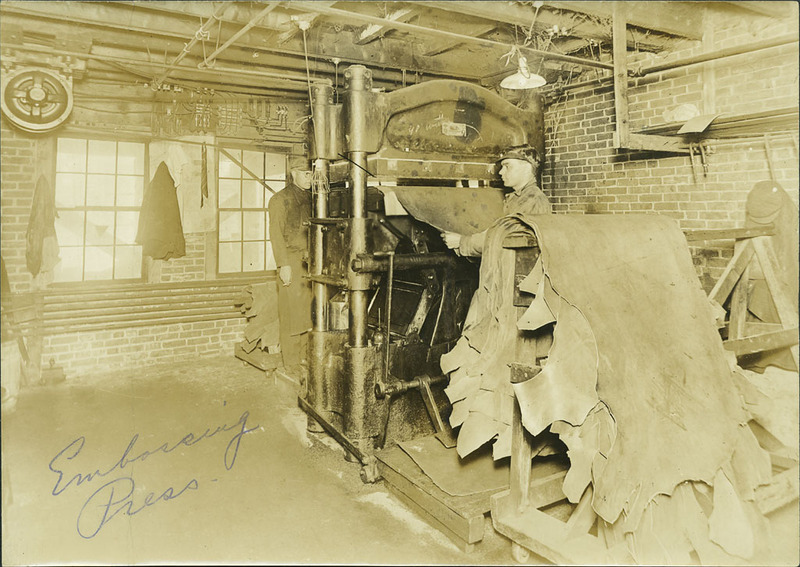 Black and white photograph with ball point pen noting "Embossing Press" at the Boston Mat Leather Company, Peabody, Massachusetts, 1918. Two men are in the photo. One stands before the press holding a piece of leather going in or out of the machine. There is another man behind the press. Windows line the back wall and leathers are draped over a large wooden horse. “Embossing press,” Peabody Institute Library, Peabody, Mass., accessed April 18, 2019, https://digitalheritage.noblenet.org/peabody/items/show/179.